Glamourous gastropub with a cocktail bar upstairs, Idlewild in Maida Vale has something for everyone if you enjoy fine dining and casually chic surroundings. From the same team behind the Ruby cocktail bars - see Ruby & Sequoia for a taster - Idlewild is their take on how a premium pub should be run. As well as the bar restaurant with its 26ft long solid pewter bar on the ground floor there's a lovely walled courtyard garden. In summer the courtyard garden is a perfect hideaway on hot summer days. On weekends, DJs and live music create a buzz in the apartment style cocktail bar on the first floor where party goers are overshadowed by the elegant glass chandelier. Idlewild gyms, sporting activities, health & beauty and fitness. 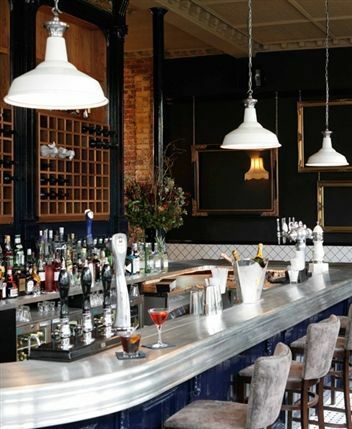 The best pubs near London Idlewild. Idlewild clubs, bars, cabaret nights, casinos and interesting nightlife. Where to have your meeting, conference, exhibition, private dining or training course near Idlewild. From cheap budget places to stay to luxury 5 star hotels see our discounts for Idlewild hotels, including Europa House Apartments London from 54% off.